CALL ERIN HOLLOWAY 318-572-6551 TO GET STARTED ON YOUR REAL ESTATE CAREER TODAY! Looking for a career in Real Estate??? You have come to the right place!! 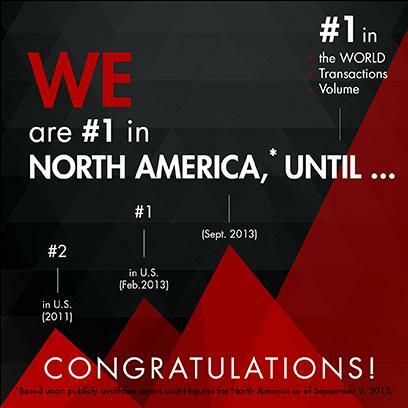 Keller Williams is now the #1 Real Estate Company in North America! announces expansion into the United Kingdom. AUSTIN, TX (September 16, 2013) - With a net gain of 12,000 associates in the past year, Keller Williams Realty is now the largest real estate franchise in North America. The announcement, based on publicly available agent count data as of September 9, 2013, was made during Keller Williams Realty’s Midyear State of the Company presentation. Keller Williams is now home to more than 90,000 associates around the world. Year over year, units are up 8 percent, closed volume is up 17 percent and gross commission income is up 18 percent. Ninety-five percent of the company’s offices are profitable year to date – a figure that far outpaces the standard for franchise businesses. In the past 12 months, the company has distributed $58 million in profit share to associates, a 33 percent increase over the previous year. The release of the Keller Williams mobile app – personally branded for each of the company’s 90,000 associates. In the past 30 days, more than 58,000 consumers have downloaded the app to their Apple and Android devices. Publication of co-founder Gary Keller’s new book, The ONE Thing, which has appeared on 117 bestseller lists, including The New York Times, where it has been on the business bestseller list for 5 months, and The Wall Street Journal, where it earned the #1 spot. Keller Williams Worldwide President Chris Heller also announced the company’s expansion into the United Kingdom. In recent years, the company’s global division has announced franchise agreements in Austria, Germany, Indonesia, Southern Africa, Switzerland, Turkey and Vietnam. Heller touted the achievements of the company’s regions outside of North America and welcomed more than 100 international guests from countries including Brazil, China, Colombia, Ghana, Israel, Italy, Mexico, Poland and Russia.